Kristal, one of our graphic designers in our marketing department, took a family vacation over Labor Day weekend. 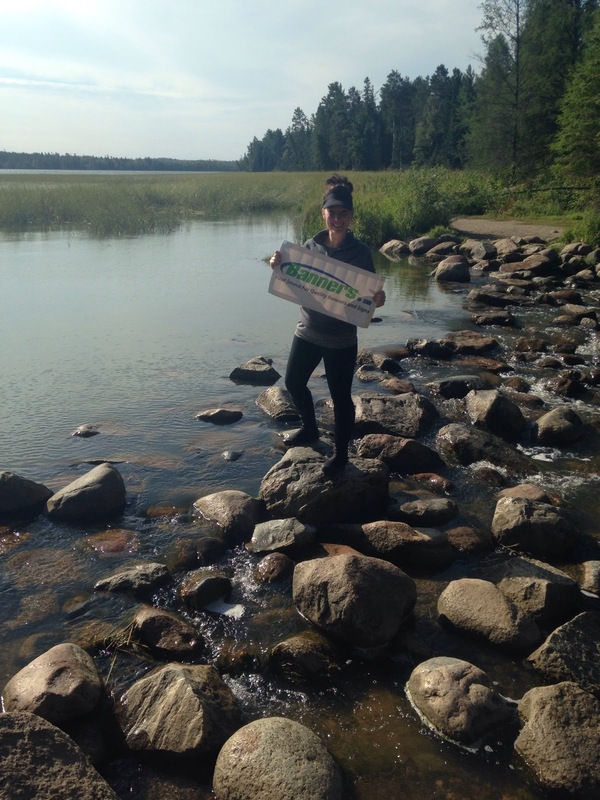 Her family traveled to Itasca State Park. If you've been following our Backpacking with Banners adventures, you'll see that this is a popular destination! This picture is taken at the headwaters in Itasca State Park. While Kristal was hiking, she was thinking "if it rains later, this banner will come in handy to keep me dry!" Her family also passed through Menahga, Minnesota where they came across the statue of Saint Uhro. The legend says that Saint Uhro got rid of the grasshoppers that were threatening the grape crop in Menagha, MN so they built a statue of him with a grasshopper kabob. Stay tuned for more Backpacking with Banners adventures from our Banners.com employees!